Yes. I am not kidding. The Slumdog Millionaire is Sold OUT. In New York City. Released in just 2 theaters in New York City (and till a few days ago, in just 10 theaters in the entire US), the movie has received an overwhelming response. The day i went to watch it, we saw sold out signs. 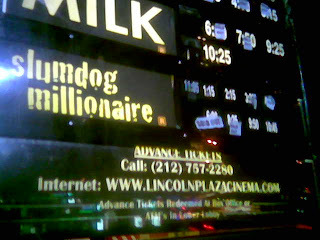 And even three weeks later, yesterday while crossing Lincoln Plaza Cinemas, I saw shows sold out. Infact, it is running neck to neck with the sean penn starrer, Milk. I was lucky because i saw it the very first weekend it was out. I had just seen a few glimpses of the trailer and was intrigued by an all Indian cast in a non-bollywood movie with some exciting visuals. And then on nov 16th, a friend called saying she was buying tickets to the movie. I was on it. And what a pleasant surprise. The movie is simply refreshing. A fairy tale. A beautiful tale. A story with so many twists. An improbable story. One of those stories are are weaved with such contemporary situations, events, people, that you wonder, "oh why didnt i think of this earlier." Much has been said and written about the movie (NY Times Review and others). There is even a live webcast of an interview with the author (Vikas Swarup) of the book tomorrow, "Q&A", on which the movie is based. I dont know how to describe the story other than that is takes the slum kids of bombay and mixes them with the underworld and the most popular game show and yet its all inspired by a true story that in the end is a simple love story. And the background score and music is simply brilliant. Who but AR Rahman, could create that magic. The movie is an all round emotional roller coaster that will make you laugh, get you the edge of your seat, sparkle your eyes with some brilliant cinematography of the great city of Bombay, amuse you, thrill you and also make you root for the underdog. In fact, for many, like never before that i have witnessed in a theater in the US. I mean that, literally. In a theater in Bombay on elsewhere in India you would hear loud claps, whistles and cheers on several scenes. But you wouldnt expect to hear that in Manhattan. But you do. People, the upper crest of the upper west side, 80 yr old, the 30 somethings, the younger ones, they are were cheering for our underdog, Saleem! A rare movie that has a mostly American audience actually clap, root for and gasp for the characters in the movie. Kudos Donny Boyle and team. The film left me mesmerized, energized, and entertained. And thankfully it didn't show the stereotypes about life in Bombay slums or in India as is usually shown in Hollywood movies. There were real characters, who did real things in real places. I couldn't stop emailing friends with messages like "have you seen slumdog" , "go see slumdog", "Just returned after watching slumdog millionaire. A must watch. One of the rare one-of-its-kind movie. Very fresh and innovative storyline reminiscent of the new style of story telling of Rang De Basanti (their stories are miles apart, though)." Go, Watch it. And Beware, most shows are SOLD OUT! So buy online and buy early. Will be looking out for slumdog to get an Oscar Nomination for sure. Udpate: Jan 11, 2009 - Slumdog wins 4/4 Golden Globes. Will definitely win Oscars.